Luke Fitzgerald thinks that Ireland are in for a tough day at the office against the All Blacks, with the former international predicting a double digit win for the world champions. 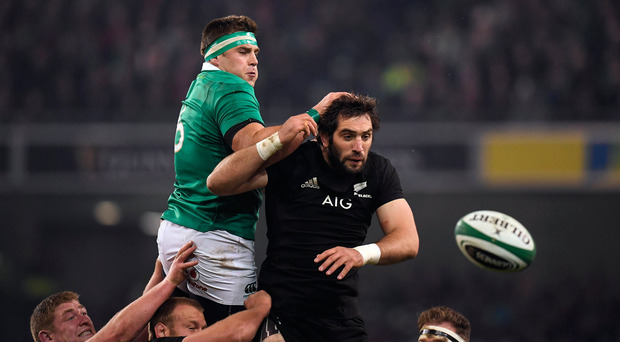 New Zealand visit the Aviva Stadium on Saturday for the first game between the sides since an ill-tempered clash in Dublin back in 2016. The All Blacks prevailed 21-9 on that occasion but with Ireland now number two in the world and Grand Slam champions, expectations are building that Joe Schmidt's men could record a first ever win over the Kiwis on home soil. Ireland remain six-point underdogs with the bookies, and Fitzgerald fears that with the weather set to be dry, the visitors could make life very difficult for the home side. Speaking on The Left Wing, Independent.ie's rugby podcast, the ex-Ireland star gave his prediction on how he thinks the result will go. "I think New Zealand are going to be on the warpath, I don't have a good feeling about it," Fitzgerald said. "I think it is going to be more than two tries. I'm going to say a 15-pointer." Scrum-half Conor Murray was ruled out of the game as he recovers from a neck injury, and Fitzgerald thinks that his absence will be critical. "I really like Kieran Marmion as a player but there is a big different in his passing and an even bigger gulf in his kicking. Murray is going to be a big loss. You look at Ireland when they are exiting, leaving aside what he gives you in attack, and the difference - I think he clears about 80% of Ireland's ball in their 22. I know as a winger, he gets an extra half second of hang time in the air and that is massive." Joe Schmidt is set to announce his future after the November internationals, with the Ireland head coach possibly signing a new contract or even succeeding Steve Hansen as All Blacks head coach after the World Cup. Fitzgerald thinks that if Schmidt took charge of New Zealand, the world champions could reach an even greater level. "The scariest thing in world rugby would be the All Blacks picking Joe Schmidt as the coach," Fitzgerald said. "It would be a nightmare for the rest of the world. Whatever his tenure is, I could see them going the whole thing without getting beaten. I don't know whether he'd be overbearing for the Kiwi guys because they are such natural footballers but I don't think so. I honestly don't think anyone else would have a chance. "I think Joe would get them humming. You wouldn't be able to get the ball off them. If they had some of the moves he has, they would be picking teams apart."